It's a little late, and I wanted to get up some kind of post today, so let's have a look at what I got and highlight some recent pickups from ebay and the flea market. I haven't been on Listia for a while because there are just no deals over there anymore. A couple three times a year, my wife and I will hit the Kane County Flea Market. First weekend of each month, so our first visit was a couple weeks back. In the past, there has just been a single guy in one of the buildings ("swine" I think) with cards. And his prices are a joke - straight Beckett on everything. Did find someone else one visit, but haven't seen him since. Well, this visit I found 4 more guys with cards. Nothing great, but I did pick up the entire series 4 of the Renata Galsasso set released in 1981. Set me back two bucks. But a great set to find, and now I have to work on the other series. This is no ordinary 2014 Golden Age but a SP. Two things about the short prints in Golden Age. First, they are all have "SP" in their numbers . Topps, feel free to steal that idea. Second, they tend to be ridiculously expensive. Check COMC or Sportlots and look at the prices. 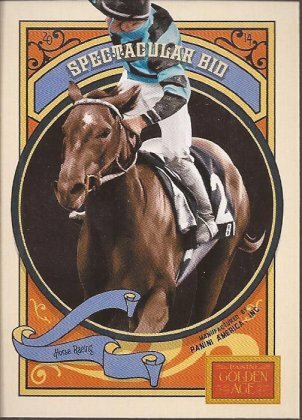 I have never pulled a short print, so Spectacular Bid is my first of any year. And while the shipping was high at $3, winning the card for two quarters lessened the blow. 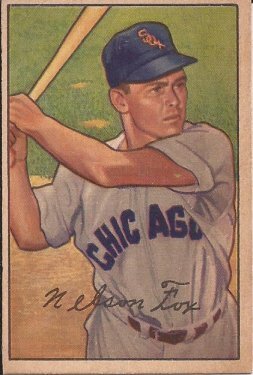 It's not the rookie card, but getting a 2nd year of Nellie Fox for under $13 shipped, in this condition, is worth it. Off center, and it's discolored, but otherwise the condition is amazing. All the '52s I followed would quickly get too far out of the range I was looking at. This one came in at 50% of my high end, so I couldn't be happier. I am also just short of the 75% goal of the Fox Project, so I'm happy about that as well. Nice fox. Early bowman is the best. Even with the shipping cost, it seems like you got a pretty good deal on the Spectacular Bid short print. I can't figure out why these are so expensive everywhere, as they are only going to be wanted by a select few, those being the few folks who are actually trying to build complete sets. I myself only have two, the 2013 Spanky I got from eBay earlier this year, and the 2014 Alfalfa that I was fortunate enough to pull from a pack. Also, that Nellie Fox is spectacular!